Cheers to the Red White and Blue! One of our favorite holidays, the 4th of July, is right around the corner. Whether you are hosting a gathering of friends and family to celebrate this important day for our nation or just want to show some patriotic spirit, here a few super easy tips to get your outdoor space looking festive. Flags, flags and more flags! Nothing says "Happy 4th" more than our beloved American flag waving in the breeze. You can find flags in all different sizes to use in outdoor planters of all shapes and sizes. We are big fans of tucking in lots of mini-flags into the sides of our pots. We'll let you in on a little secret. We're obsessed with flag bunting! The bunting in this picture is 3 feet wide and 1.5 feet long - the perfect size for many windows. But wait, there's more. Don't stop with flags and bunting...throw some red, white and blue pillows on your front porch bench and outdoor furniture. Now you're set! It's so easy right? You even have time to whip up the mother of all 4th of July desserts, the patriotic classic...FLAG CAKE! Happy 4th friends! We love to use a kimberly queen fern as our thriller because of its upright leaves and it doesn't shed spent leaves like other varieties of ferns. Dragon wing begonia is actually both a filler and a spiller. The flowers come in either a light pink like in the picture above or a soft coral color. Gorgeous! Vinca major variegata is one of our new favorite spillers. We think the variegated leaf adds some extra interest to the arrangement. We really love it so expect to see a lot of it in our fall planters too! Plant haircuts, watering and garden pests...OH MY! Plant haircut? If you have ever used margarita sweet potato vine in a pot before, you totally know what we're talking about. Typically late June is when we need to give our sweet potato vine plant babies their first haircuts. We don't like this aggressive plant to crowd out the filler plants or get too long. It grows like crazy so we end up giving it many haircuts before the end of summer. The purple and variegated types of sweet potato vine don't grow as profusely so we don't have to trim them back as often. Even though the margarita variety needs more maintenance, we still adore it for its pop of chartreuse color and fullness. It wouldn't be summer without outdoor pests right? Unfortunately sometimes those bugs get into our container gardens. We are big fans of an insecticide called Eight which kills over 130 insects. Every year we battle bugs on hibiscus blooms and spraying with Eight a few times a week over two weeks will usually take care of the creepy crawlies. We recommend Natria Insecticidal Soap by Bayer Advanced as a great option for clients who prefer to use an organic product or if you are using it on or near herbs and veggies. If we can leave you with three words of wisdom as we enter into the dog days of summer...WATER YOUR POTS! Seriously. We like to water first thing in the morning so the plants don't bake all day. Sorry to deliver this news, but you may need to water TWICE a day if your plants are in the full sun all day, especially if it is windy since the wind dries out the soil. If your plants are in the shade you may only need to water every other day or once every three days. Just pay attention to them. Are they wilting or getting crispy? If so, that's the plants saying, "More water please!" Make sure to follow Adorn on social media for helpful gardening hints for your container gardens to keep them looking beautiful all season long. Whether you are moving into a new house or just need to update your outdoor planters, let us help you find the perfect pots for your space. Over the past year we have enjoyed helping dozens of people in Kansas City and Oklahoma City find new planters. It's easy! Just call us and we will come to your home or business, measure your space and get an idea for your style and existing color scheme. Next we will follow up with an email that includes pictures of our planter recommendations along with the planter dimensions and pricing. 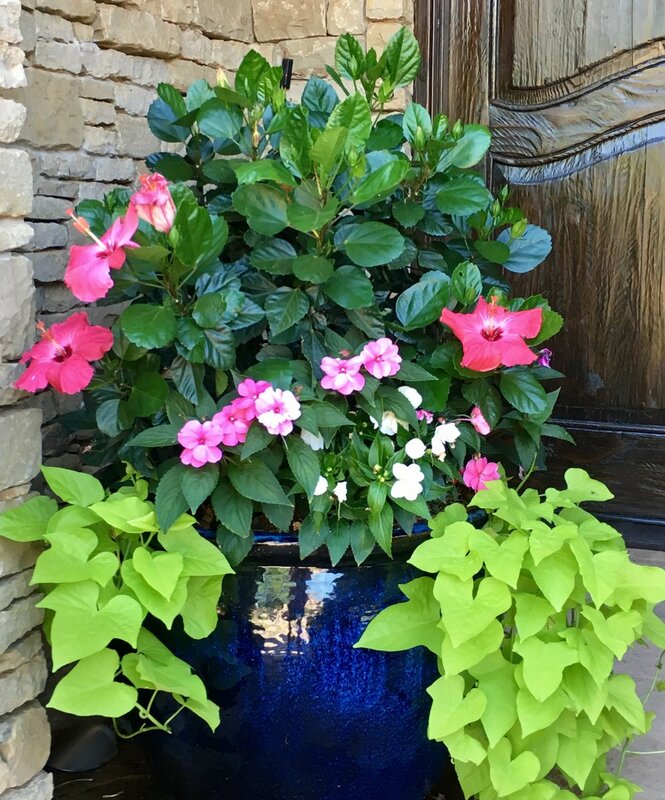 Beautifully planted outdoor pots are an easy, inexpensive way to create an attractive, welcoming first impression for your home. 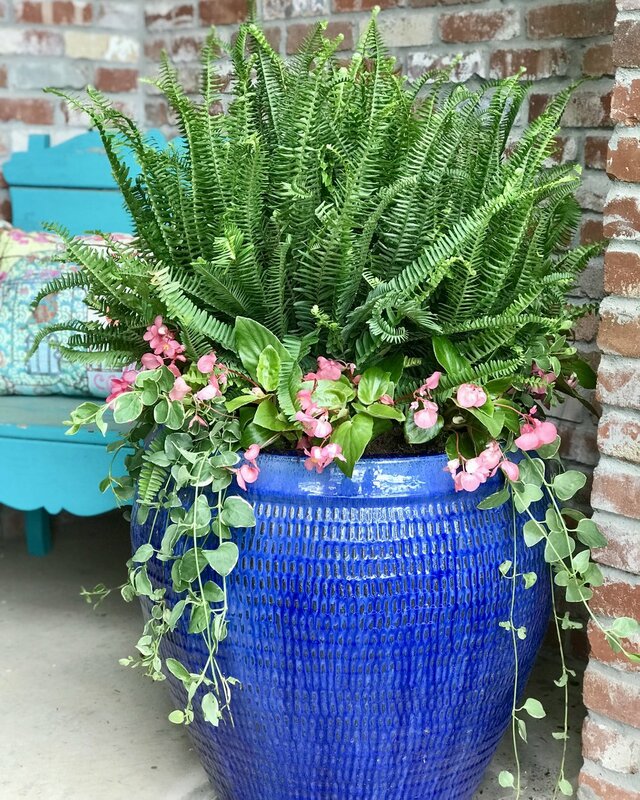 Of course, you need pretty pots to maximize your home's curb appeal so let us know if we can help you source the perfect planters for your outdoor space. We loved "adorning" the front entrance of Charter Clinic Immediate Care and Oklahoma Injury Care in Northwest OKC. It is conveniently located off of the Broadway Extension at 200 W. Britton Road. We love it when we can take a task off the plates of busy business owners. Our friend and owner of this medical office loves to dig in the dirt herself but found that she didn't have time this spring. 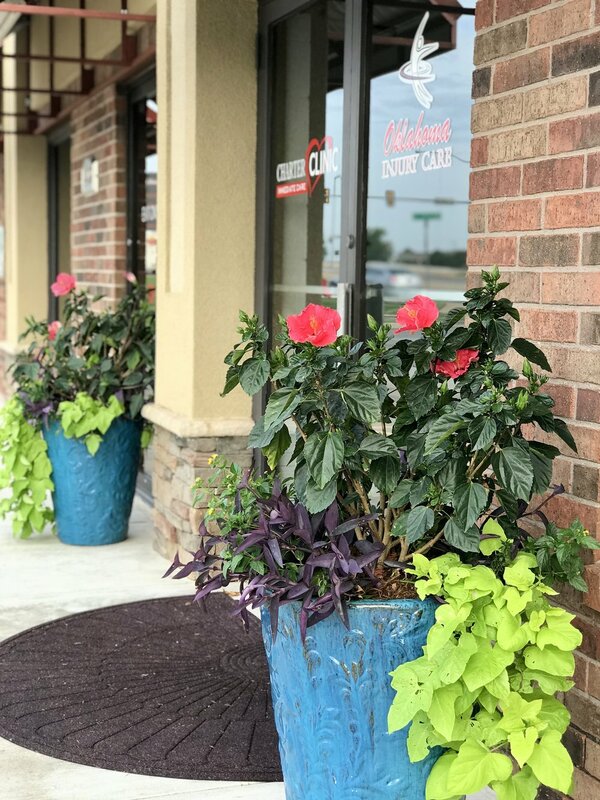 We were so happy that she called us to add some cheery curb appeal to her medical office. Newer PostTHE DIRT - Herbs in outdoor planters? Yes please!